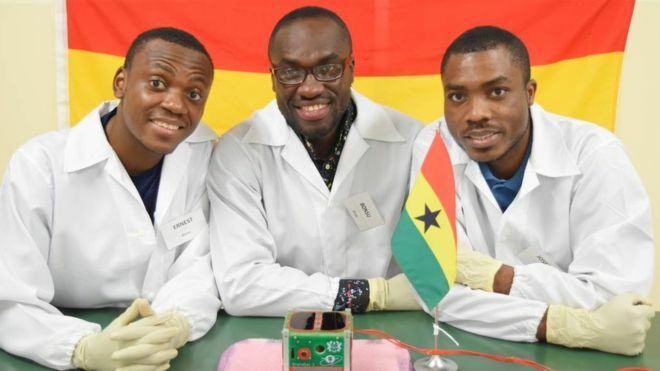 GhanaSat-1, which was developed by students at All Nations University in Koforidua, was sent into orbit from the International Space Centre. Cheers erupted as 400 people, including the engineers, gathered in the southern Ghanaian city to watch live pictures of the launch. The first signal was received shortly afterwards. It is the culmination of a two-year project, costing $50,000 (£40,000). Project coordinator Dr Richard Damoah said it marked a new beginning for the country. “It has opened the door for us to do a lot of activities from space,” he told the BBC. He said it would “also help us train the upcoming generation on how to apply satellites in different activities around our region.